I started a new thread. I posted under Jamison last thread...best to start a new. The intention is to have a part 1 through part 3. Part 1 shows that increasing tube sizes, it is a key factor to help lower the input pump horsepower to feed water into the boiler. I attached some designs that Jamison and I were kicking around. Important to note: lightest weight makes a big difference when in a vehicle. The last picture is a natural circulation concept...this will lead to Part 2. > the drill to then screw the wire into the tube. > It goes in quite easily. Will the FIA allow a pressure drum/ accumulator for the LSR? I cannot tell you about the FIA...but the SCTA-the official sanctioning body at Bonneville, would not even consider a drum type boiler when I asked them about it. They were concerned as soon as I mentioned I'd be bringing a steam powered vehicle for inspection, and were clearly relieved when I let them know I would be running a monotube steam generator. When we ran, most everyone stood back a good distance when we came up to the line! 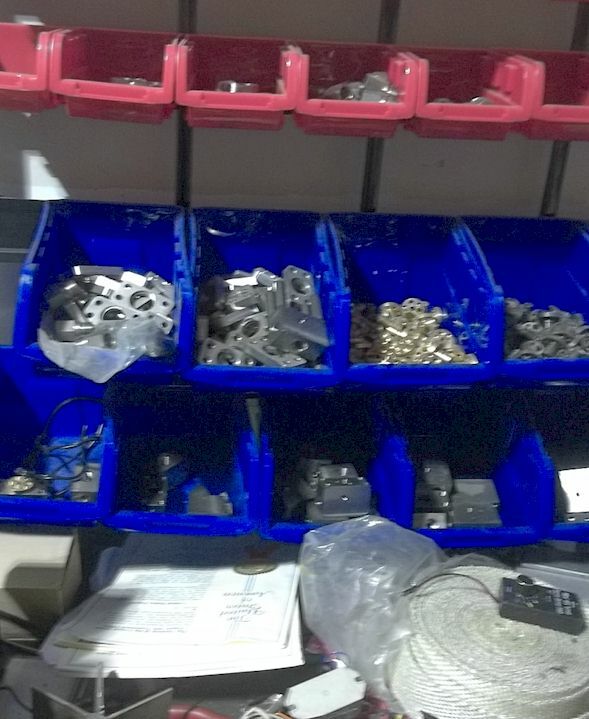 The SCTA requires all vehicles to go thru a stiff inspection process before you're allowed to run, so make sure you have the latest rule book to go by as you do your build. Chuk is the one to answer that question best. Some added information that would be of value is to work within ASME guidelines. The boiler pictured with me above would be classified as a M-boiler. This is because of the size, considered a micro boiler. As proof of a design, I would recommend presenting a stress analysis of the system or drum in particular because it is the weakest link. An analysis of what my son did for me, he is a BSME also with; I would say, expert in Solid Works, and present this to the governing body of LSR. In addition to an engineering analysis, I would provide a validation test. I attached an example where I had American LeFrance test my boiler in my Steam Scooter. All this provided, I would think, will provide approval. Of course, all this is speculation. However, I've experienced this process with other aerospace concepts with good success. 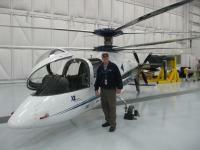 Note that I had a good stent with Sikorsky Aircraft and indirectly with the X2...one of the fastest Helicopters in the world. Hope this answers your question. I'll provide part 2 soon. However, I'll offer a reason, justification, for introducing a drum/accumulator in the mono-tube design. Please switch to the How I would Build My Boiler thread for future questions. There is another counter intuitive point to address. This is in regards to control and using a drum. I'll continue the counter intuitive point regarding control and using a drum...soon. 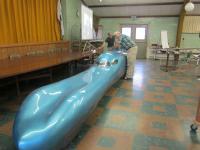 Chuck was at the 2013 SACA meet with his LSR car. We all got a chance to see it run. I'd like to take the time to say Chuk has been areal asset, influence and all around nice guy in the SACA Club! The first meet I showed up at, Chuk took a real interest in my Steam Powered Scooter, I'll never forget that. The Flash Steam Hydroplane and Chuk's LSR car are very similar in operation. Consider Chuk's LSR a scaled up version. I see that Peter posted under the LSR thread about how Chuk's machine operates. He is essentially correct, the boiler runs almost full bore, poor on the coals. He burns gasoline though. Any way, same situation as the Flash Hydroplane, it runs full bore. Chuk cannot run the wheels full bore and just drop them to the ground and take off down the runway. He dumps the steam and actuates a clutch to make the transition to speed. It is more complicated than that and just using this point to show the logic to adding a drum. Why does he do that? 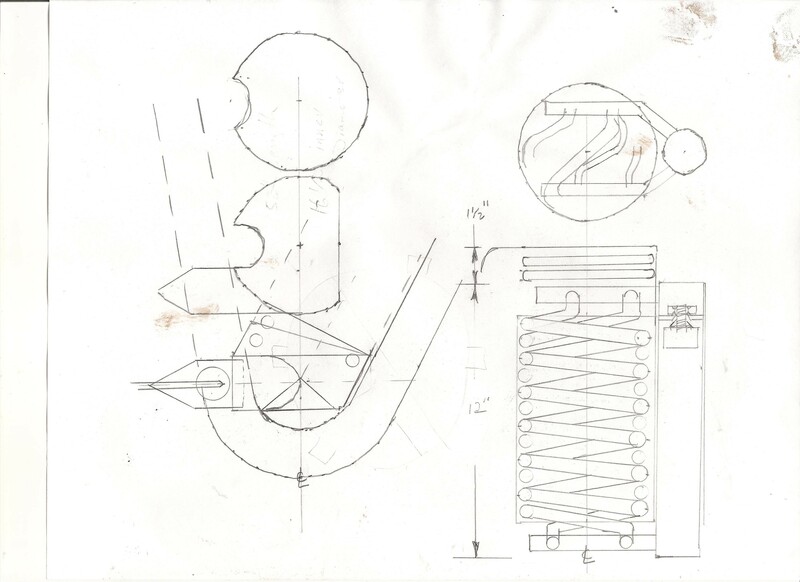 In order to get the tuned result of his mono-tube boiler, he devised this operating plan. He could not control the mono-tube to make the transition from push start to speed. At our last meet, Chuk talked about this swash plate engine. Key point is that another stellar Gentleman, Jay Carter, gave Chuk the concept to allow a larger tube equivalent to the piston volume to allow the expansion for his mono-tube. This is just before the manifold to the steam chest. Just a larger tube diameter about 7 or 8 inches welded into the path. Why, so it is easier to control. Jay Carter gave a talk years ago. He asked the group, "What gives the steam engine RPM?" The answer is Pressure. Higher the pressure, the faster you go. Another pretty fart smeller, sorry Smart Feller, I'm talking about Art Gardner. He is a direct consultant to Chuk. At the last SACA meet, he said, "I like using a pressure vessel". This is what gives you that quick acceleration from the start. The torque engine that all the Stanley guys show off. Ron's buggy...what a real performer. His Ofeldt has a drum. I agree with Jeremy, Ron has great knowledge and experience. Yes, adding a drum to the system is counter intuitive to the Less-is-more regarding the quantity of water. Adding a drum to a mono-tube does add the ability to store energy for quick release. It allows many more options for control and provides that swish start from a stall. Hope that's clear to explain the reason for the drum at the end of the mono-tube. Hope to provide part 2, the addition of natural circulation. You asked about copper tubes and how much pressure. I'm planning/building a Gentleman Speed Roadster. It will look like one but be a little scaled down and using a 10 HP Stanley Engine. My machine is planned to be a 400 X 400 (400 PSI at 400 degrees F). You guys were talking about much higher pressures in the LSR thread. Are you going for a super critical steam generator? 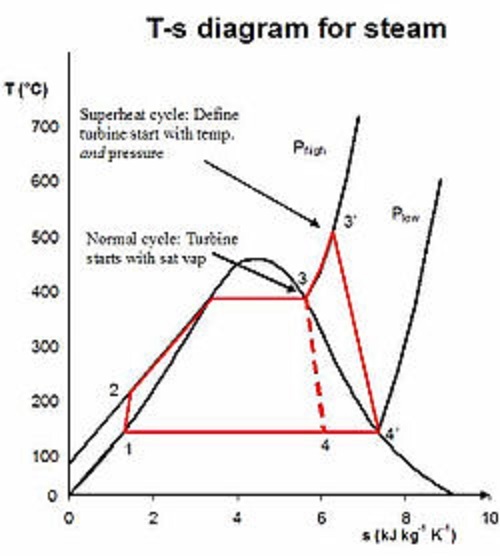 My definition of super critical is where the path of the water to steam goes over the top of the bell curve on a TS diagram. Water when released to the engine goes directly to steam, no wet steam involved. I will discuss a way to get super critical after I go through Part 3. Stay tuned. PS...I'll be at Cabin Fever this weekend on Sunday morning. Let me know if anyone wants to meet and tool around together. When one adds the variables in a Mono-tube such as on-off fire and on-off feed, the mono-tube responds with varying amounts of dry steam and wet steam and or perhaps even super critical steam. In order to get a mono-tube to work, it requires some type of flow control. Moreover, the vehicle requires use of a clutch. 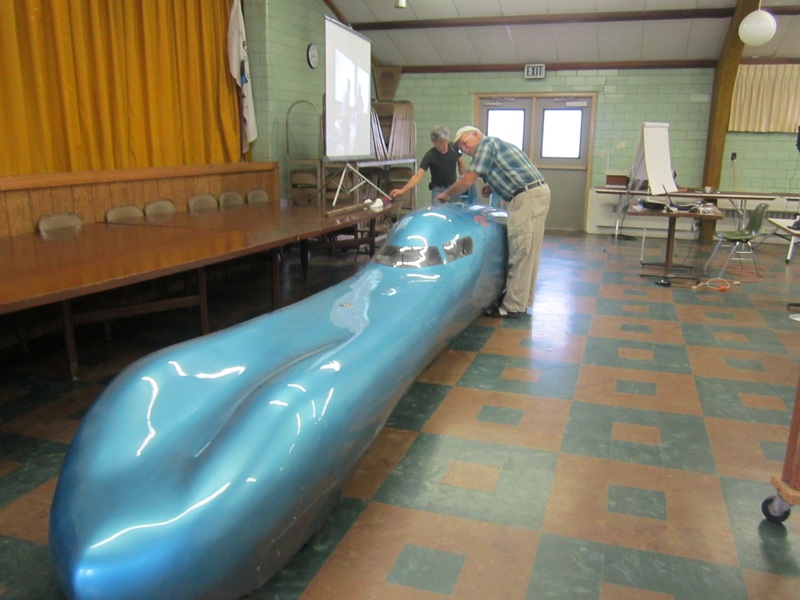 In the case of the Hydroplane model, it just goes all out, balls-to-the-wall and does not require transition from stop to running. Note that I do not mind that mono-tube systems use a clutch. I prefer to have a vehicle that is direct drive and has some acceleration to it. 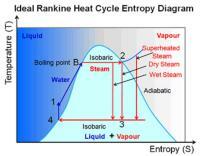 This describes the heat into a system leading to higher energy levels. The classic example is the glass of ice water. The mixture of ice and water holds at a 32 Degree constant. It isn't till the ice melts that the water temperature goes up. Same thing happens when the mixture is water and steam, called wet steam, the temperature is constant until all the water turns to steam. 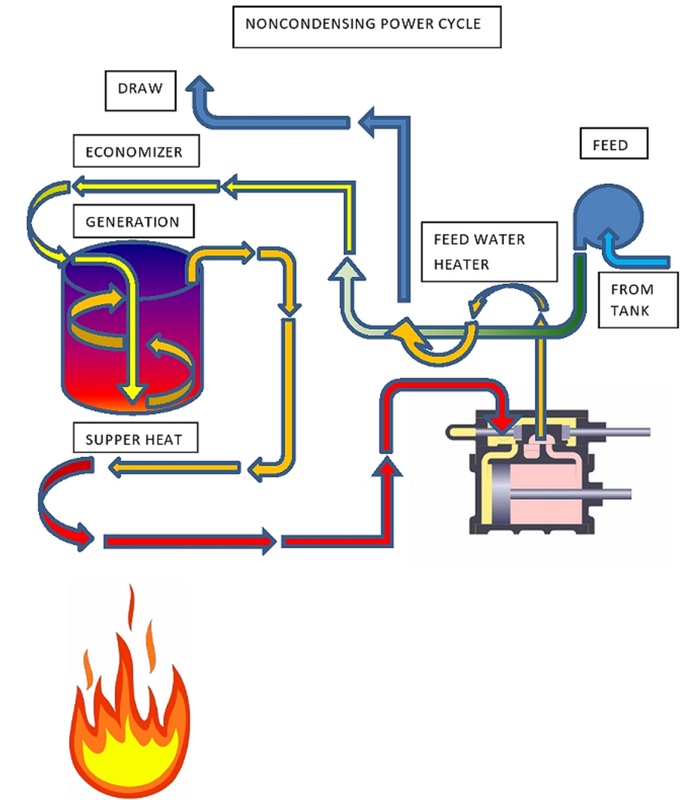 We use T-S diagrams to show this and I attached 3 situations, my steam scooter boiler (fire tube), mono-tube and future car, hybrid mono-tube/natural circulation with a super heat and re-heat. 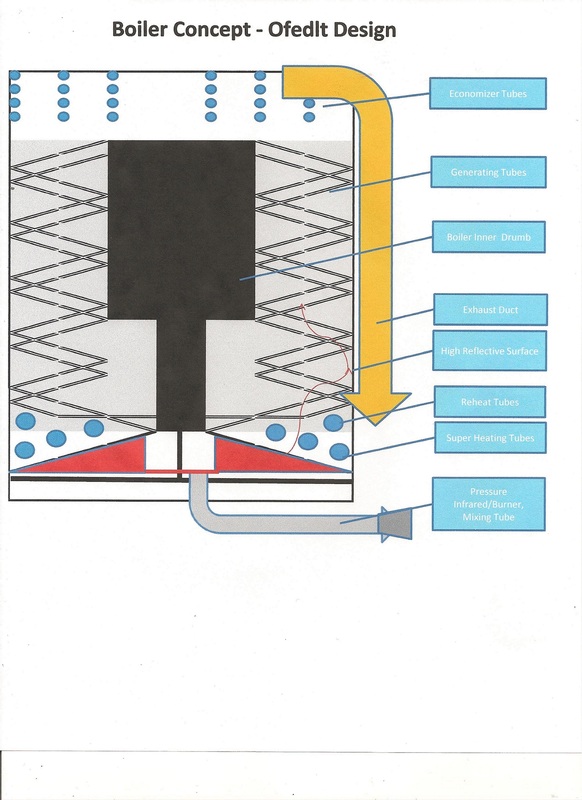 In the first diagram, this is what is happening in a classic boiler. Water goes to ~212 degree F (point "B" then remains at that temp to point 2. I actually have super heat on my Scooter. 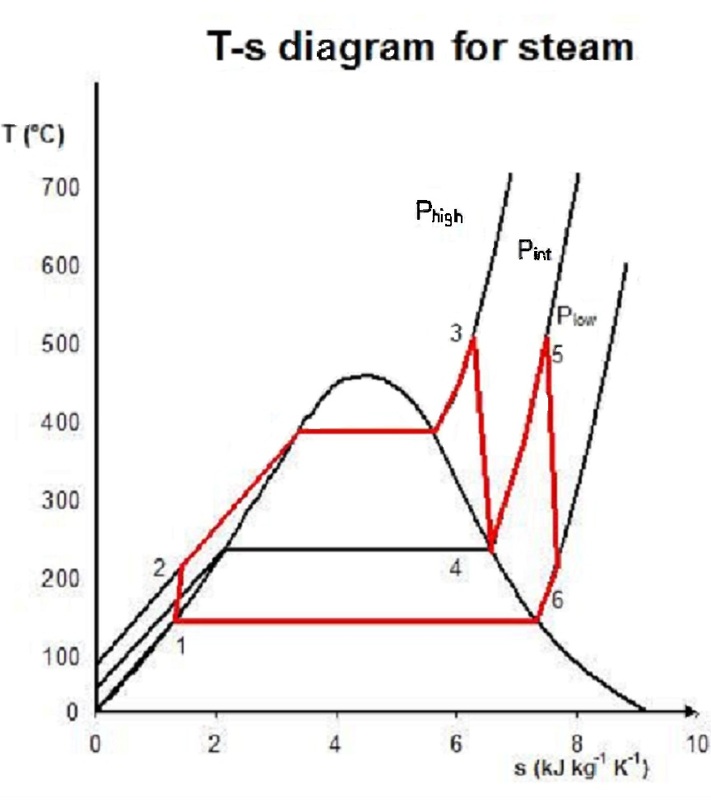 Then Steam is expanded down to the line where point 3 is located. This is the basic Rankine system and typically has water level control, direct drive and when saving up the energy in the boiler; has good acceleration. The next diagram is for the mono-tube. This is my interpretation to show what happens when one has on-off feed and fire to the system. What happens is you get varying steam, wet steam and perhaps super critical steam. I like watching Jamison with his mono-tubes. His engine is either gobbling water or accelerating with good steam. Most of this explanation is credited to him. I'm just trying to relate it to engineering methods. The point here is that you're going to get variation in the mono-tube if you cannot keep constant feed and temperature. This will lead to water going to the engine. In Jamison's situation, water to the drum. This is the reason I suggest the mono-tube to a drum. Question is what do you do with the water in the drum? I suggest natural circulation to make steam like in an Ofeldt. The 3rd diagram is what I would do for an efficient system. This would be a Mono-tube and natural circulation with a drum. I would expand through an engine say on the rear axle. Then re-heat back through the boiler on the way to an engine on the front axle. Yes, this would be a 4WD Steam Car. In summary, trying to utilize the simplicity of water level control, starting from a stall w/out a clutch and ability to have that acceleration that impresses the riders. This boiler can be lighter than the Ofeldt and have better performance for producing/replacing the steam. Next part, part 3, will be how the configuration might look along with the burner. Last thing is that a mono-tube will produce pressure and temperature equal as they climb. This might require tempering the steam temperature when going for higher pressures. The drum allows pressure to climb without rise in temperature. After the drum, through the throttle valve, a super heater can be made suitable to the engine's thermal capability. Thanks Jeremy, I'm glad this is getting the wheels turning. Really love what Jamison does. He provides real experience with mono-tubes that I enjoy relating to engineering theory...very helpful to coming up with the "How I would build my boiler" concept. Direct experience with a mono-tube boiler...the pressure and temperature climb at the same rate. Note that I said, "I'm the computer"
I'm probably ramblingly on...I'll keep going. Through this thread, I hope that it doesn't come across as a know-it-all. A lot of things don't always work out, i.e. I tried an air preheater on my Scooter. I called it the Clam because of the cherry stone shape on top of the boiler. I just couldn't get it to work. Suffice to say, I have a lot to learn. There are areas where I may not have proof or objective evidence that the concept works. I'll state that when doing the explanation. OK...consider a couple of things with regards to boiler design and as it relates to mono-tube & natural circulation boiler. 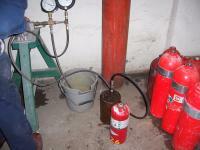 Some of the basics like gravity and orientation of the burner, coils and drum. These factors can influence the size and shape of the boiler. However, they relate to the capacity or the ability to supply more steam. A ship boiler produces more steam than a steam automobile given a ship might have triple expansion while an automobile might go so far as have a double acting compound. Other consideration regarding the burner is the flow of hot gases, the use of types of heat exchange, energy exchange, like infra red. We often brag about well I have a million BTU burner and it burns a gazillion gallons an hour fuel. All this is going into my system. What's coming out? Where are we with regards to combination mono-tube & tube boiler? So far we have 100 FT of mono-tube (generating tube) in an increasing diameter of tubing fairly consistent over the 100 FT. Next, we are adding 40 FT of natural circulating tube to generate steam from carry-over collected in the drum. Note that we'll be using the Ofeldt coil in a configuration that might work well for us. The total is 140 FT of generating tube. We'll talk more about this later. 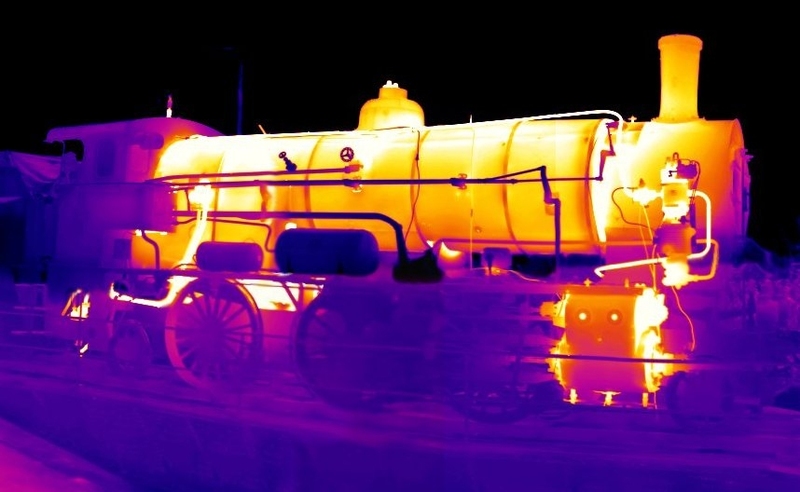 Use of infra red (IR) is a little bit of mystery. 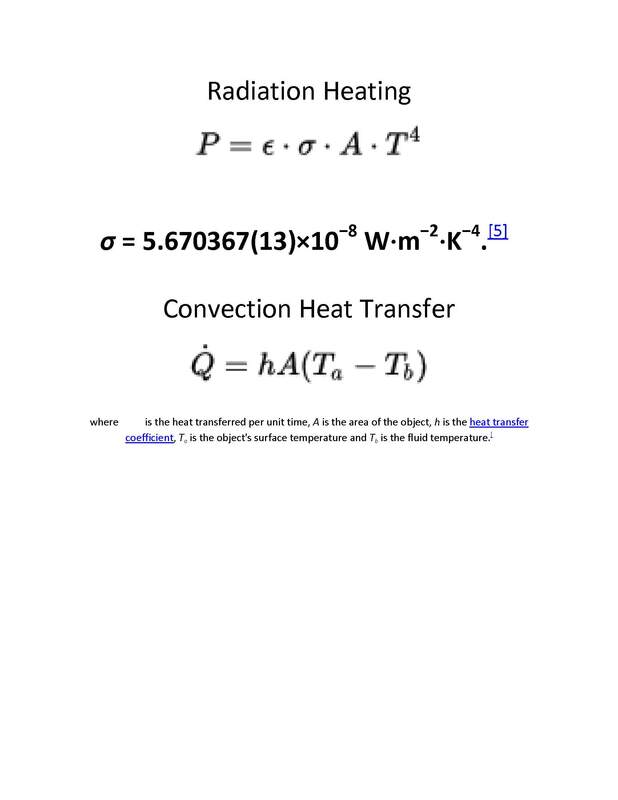 If you compare the equations that relate to heat transfer, the difference is that the radiation equation provides a 4th order to the temperature. What does this mean? 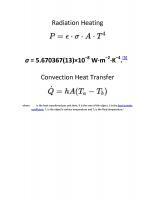 The IR method far outperforms the convection method of heat transfer. I attached a concept using IR in an Ofeldt concept. Candidly, I'm still working on how to integrate a IR into this new combination boiler. I'll keep working on it and should have something to convey soon. This device wouldn't be the entire thermopresser, you would need to use it's high velocity output to drive your final jet pump. In the business, they refer to this as a 'steam cooled' reactor although the driving steam is condensed by the feed water before entering the circulation coil. I've read that quite a few times about the Ofeldt having too much open space and letting gas through etc. However, shooting the exhaust gas temperatures which are close to the steam temperature, there is nothing else to be had. The boiler is doing it's job, it's absorbing a few thousand degrees in temperature from the fire as evidenced by the temperature of the flue gas. More restrictive flow isn't going to change anything. The boiler in the pic, that is 160 feet of tubing. 16 coils at 10 feet each. Ron brings about a good argument in the unsubstantiated theory that the Ofeldt is too open and allows too much flow through. Your statement, "my big objection to the Ofeldt is that, even with overlapping coils, the gas flow is a bit too free for best efficiency." However, I would like to address this respectfully. 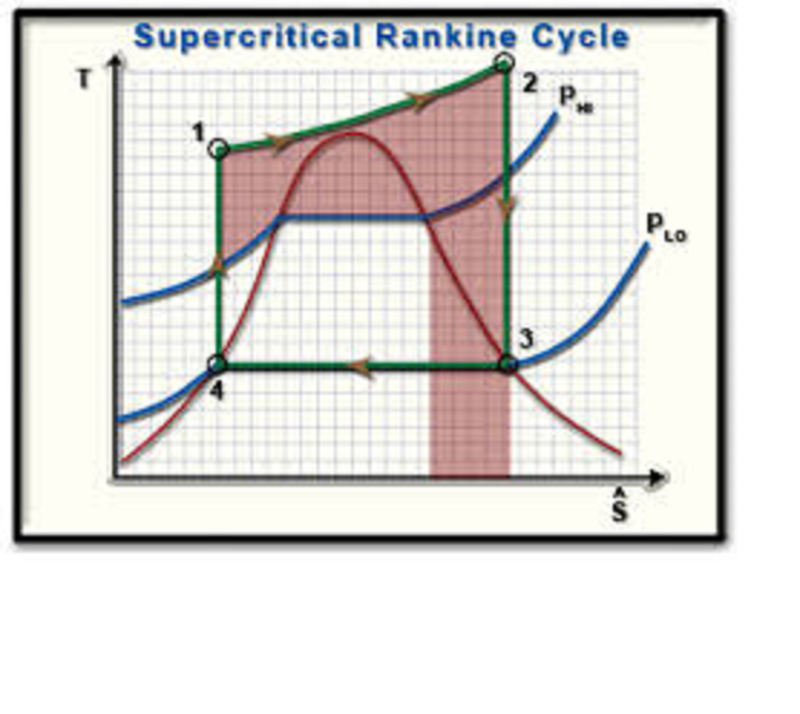 Attached is the Rankine Efficiency. Basically the work out over the energy in gives that fancy looking n (efficiency character). To isolate the efficiency to the Boiler alone is really not fair. Ron can argue with his entire system that he is pretty efficient. I know, I've run up and down his parking lot barley able to keep my hat on! This is a pretty good efficient system (Rankine system). I'm talking about his Buggy that has that Ofeldt he describes above. However, lets look at the Boiler alone. Yes, the boiler would probably be inefficient, my opinion. I have not performed any verification of this. Can the boiler efficiency be improved...yes. Does the Ofeldt boiler work pretty well with super heat, economizer and feed water heating...yes. So much so, I built my Ofeldt. Please don't let this turn into an argument. In continuing part 3, I will be addressing this. I have stated to Jamison about this very concept, gas flow through the mono-tube boiler. Set up the gas flow to travel a "mile per minute" My direct experience is with my Steam Scooter along with Nick Mesmer helping me develop my firing process. At one time I attached an electric duct fan to my exhaust, fired the boiler with significant flame. This is why my copper surround is sort of burnt looking. Here is the discovery, when the fan was on, steam production was significant. When the fan burned up, sort of blew up...real fun, we observed a definite decrease in steam production. 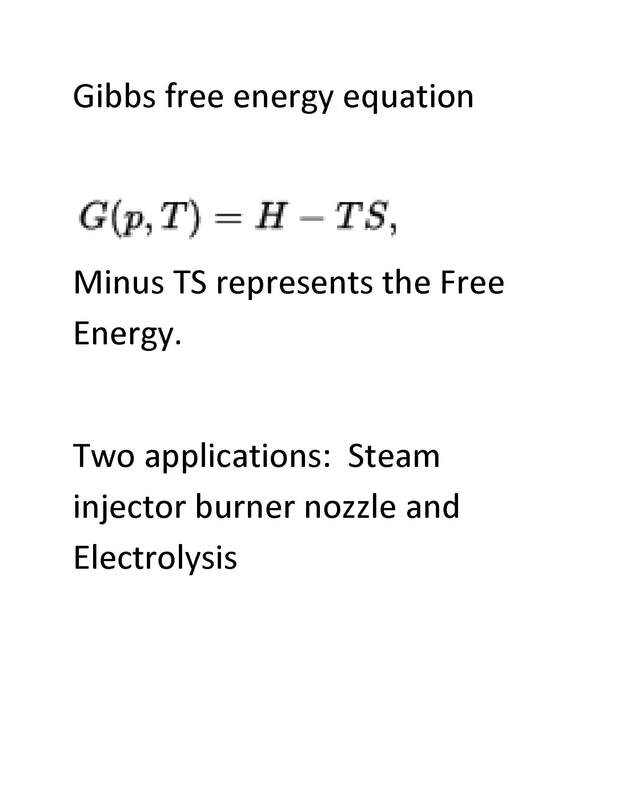 In summary, the faster you can get the gas to flow through the steam generation area, the better heat transfer. The higher Reynolds number plays a big part. In other words, you want turbulent flow. This will be reveled in the part 3, more to come...I'll address the forced circulation concept first, next thread. Ken, thanks for bringing that up! Fellas, Do know, I'm not trying to win an argument or debate, I'm just sharing my personal experiences and of course your experience may differ. One thing to note, Tony and I have practically the same set up, many of my system ideas I got from him, however my vaporizer scheme and fuel type differs greatly, also burner operation is quite a bit different, hes using Propane/gasoline, I'm using White fuel/Kerosene for operation. Having two systems that are similar in operation is good to compare different ideas one to the other. One thing I've noticed, I have quite a bit more heating surface on my boiler, however his boiler fires up much more quickly, which can be attributed to his use of Propane and a little bit less water volume. It seems as though with mine having 40 more feet of tubing (I have 16 coils and he has 12) that mine would fire up more quickly, but it doesn't and there isn't a great deal of difference in overall steam generation over time and demand, mine is slightly better, what is very similar is burner size and the amount of fire. I think this plays in to my statement earlier in another thread, "It all starts with the fire" The amount of heat is what is important, heating surface and engines with clever valve design can make modest improvement in efficiency, but the amount of fire/heat is the most important aspect in regards to overall performance. It simply takes X amount of heat to produce X amount of work/horsepower. It may be a case where my boiler has more surface area than actually needed as evidenced by the flue gas temperatures which are close to the steam temperature. There is an obvious cut off point where no more surface area is being utilized for effective heat transfer, the only improvement that could be made in regard to steam generation over time would be simply more heat. Edited 1 time(s). Last edit at 01/26/2019 09:11PM by IronChief. From my experience of firing up our five different Stanleys: Our Stanleys all have Baker burners and they all fire with Hexane for the pilot light and they use straight kerosene for the main fuel. The only differences are in their boiler sizes and burner sizes. The 20 HP boilers with matching 23" Baker burners can usually be fired from cold to rolling in about 5 minutes. The 30 HP boilers with matching 26" Baker burners always take at least 15 minutes from cold until rolling. 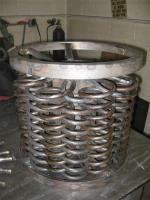 The 20 HP boilers measure 23" diameter by 14" tall with about 773 half inch fire tubes. 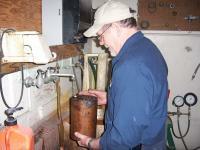 The 30 HP boilers measure 26" in diameter by 16" tall with about 1,000 half inch fire tubes. The boilers here having only the differences of firing surface area, burner size, and the water volume in their boilers. The additional water volume to be steamed in the 30 HP boilers always takes ten minutes more heating time rather than just more heat than the 20 HP boilers do. The bonus here is the performance of 30 HP boiler has easily half again the evaporation ability to produce steam. Another bonus is the steam storage capacity and evaporation rate of the larger 30 HP boiler is at least half again more. The larger boiler always takes more time to steam from cold, but the performance over the smaller 20 HP boiler is very significant. I do not have any hard numbers for you to crunch for the performance, I only have my results measured by my senses. And my senses say: give me the 30 HP boiler to run with! I will wait the extra 10 minutes for firing up time of the 30 HP boiler just so that I can experience the higher steaming rate of the 30 HP Stanleys. Our 1911 Stanley 30 HP model 85 touring usually doesn't know what hills are. It steams easily along as if everything is on flat ground. The 20 hp boiler equipped Stanleys labor up the hills. The fuel and water consumption of the 30 HP Stanley is about half again higher than those with the 20 HP Stanley boilers. Another benefit of the larger boiler is that it doesn't run out of water as quickly as the 20 HP boilers do. The 30 HP boilers carry more water in reserve than the 20 HP boilers carry. Therefore, the 30 HP boiler level sight gauge changes much more slowly than does the 20 HP boiler level sight gauge does. 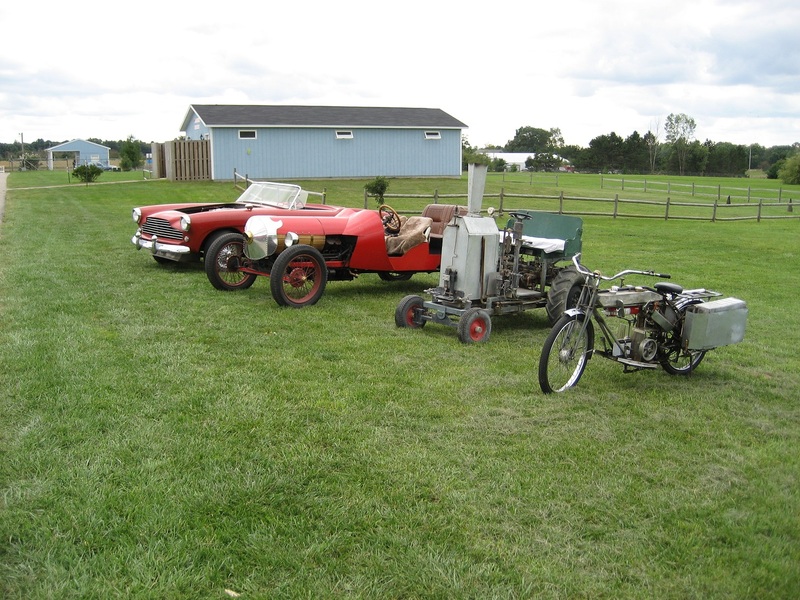 Given a choice, I would always build my steam car using the larger boiler. 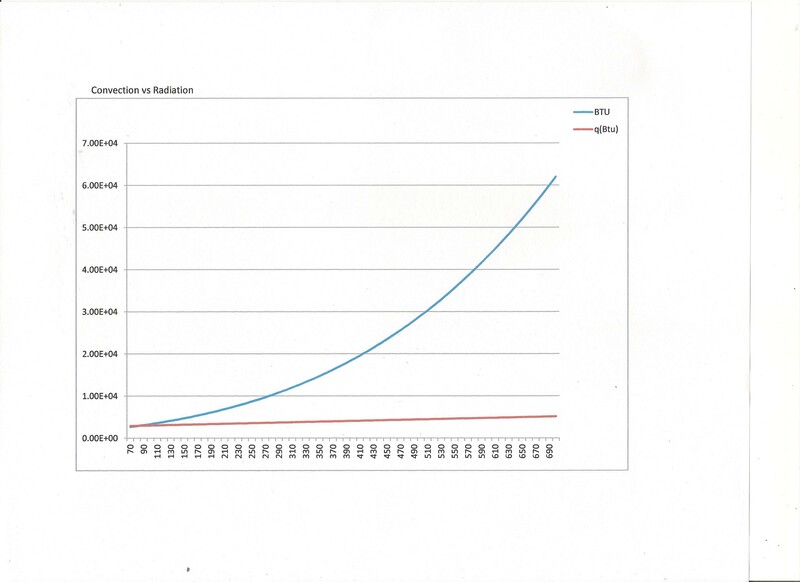 The boiler's evaporation rate has to match the engines steam consumption rate though. 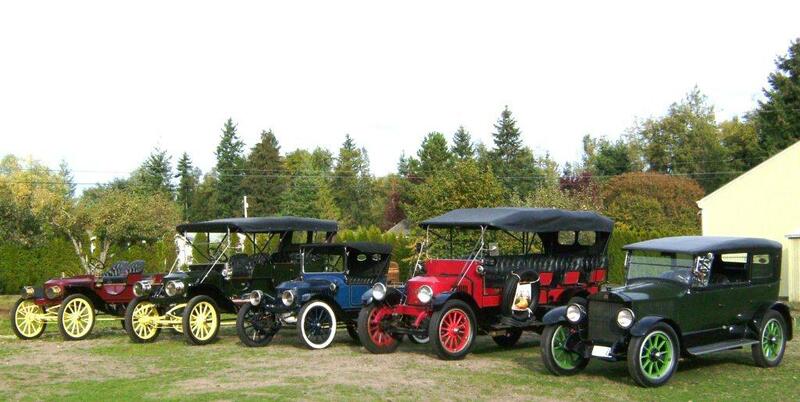 An example of matching is our 1914 Stanley model 606, ten HP roadster. I have a 20 HP boiler in the 10 HP car. In climbing steep hills, the 10 engine can't use all of the steam that the 20 HP boiler can produce for it. The 20 HP boiler soon cycles off on the steep hill and with the main cycled fuel off, I lose my super heat from the super heater. On the level ground though, the 20 HP boiler can push the 10 engined Stanley along at 70 MPH which is way too fast for the 1914 automobile. That is lots of good info to look at and use, thanks. Okay, the 23" burner is 415 square inches and the 26" burners is 530 square inches. That is a 22% difference. Sorta goes along with the heat, or does it? Forced circulation concept: no doubt that forced circulation works well. Tony proved that it can be done quite successfully. I have ridden Tony's bike when it was a forced circulation system. That bike had some go-juice to it! I'm generalizing, the bike had an economizer before feeding water into the circulation circuit. It just warmed the water, no steam when water was feed into the system. The generating coil was a mono-tube. A piston pump provided the circulation driven from a jack-shaft. I don't know how much energy it took to drive the pump. However, it wasn't enough to hinder the operation. You mentioned too.... "The recirculation tube wrapped around the fire does a excellent job of harvesting infrared energy. Since it's relatively short, there isn't much pumping effort needed... this also fits the bill for natural circulation. The economizer coils can be whatever is easily manufactured and capable of great heat absorption, the monotube fits the bill nicely." You are absolutely correct! Also, to take advantage of gravity in a thermosyphon configuration w/ shorter tube driven by an inductor/injector/Heliojet would work along with direct IR exposure...a good concept! Ken, there are many ways to skin-the-cat. Unfortunately this would not work well with the configuration I've been setting up. The length of tube in just the intended mono-tube part of my boiler will take the energy out of the pumped water. Not enough umph-pop-pa (German for force ) Another is that I'm probably limited on experience, to Tony's vehicles, Stanley's and my Scooter. With that said, Tony changed his bike to a natural circulation tube boiler configuration. He likes that over the forced circulation system, a lot less to go wrong like check valves, pump seals, etc. 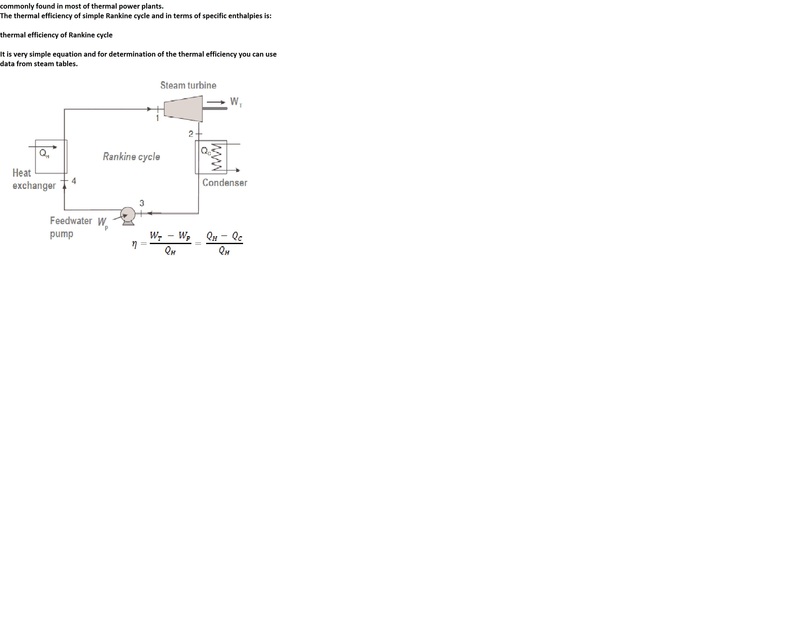 I have not seen or touched an inductor circulation system like the French or other. Maybe if someone builds one, we'll see. Keep in mind who owns the World Steam Speed Record (British) and how many boilers did they use. Also keep in mind the Steam Speed record achieved from the Stanley's at a pretty early time...I guess I'm saying what did these guys think? Part 3 will continue tonight when I get home. Note that is same as "B" the letter. If I were to build a motorcycle as a big brother to my Scooter, I might go with this concept, the twin clam boiler. Each coil would be wound independently. The first run of mono-tubing would be for the center return and then the coil at the specified diameter. The natural circulation would be a standard Ofeldt coiled tube with another one threaded inside. two (2) ten (10) foot pieces would make one subassembly. Then the subassembly threaded into the boiler assembly. The assembly will start from the inner most tubing working your way outward to the outside tube. 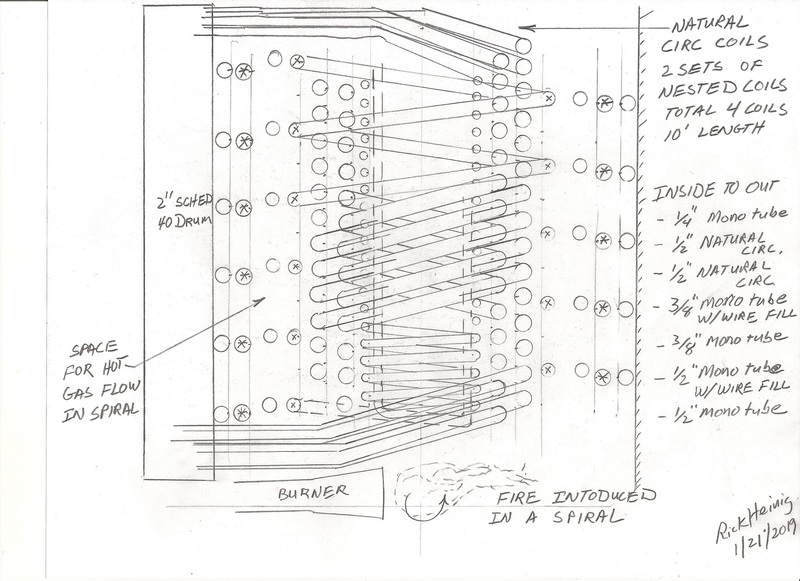 Each coil will have connections to other tubing or drum at the top of the boiler. This is a position within the boiler shell and at the top most part of the assembly along with the farthest from the flame. 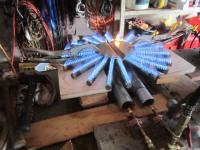 The only silver brazing at the bottom will be to the drum and away from direct flame/heat. The hot gas from the burner will flow in a spiral upward, counter clockwise direction. The flow will take advantage of the mile/min philosophy. Spacing on the outer coils will be great to spread the heat out around the inside of the boiler shell. 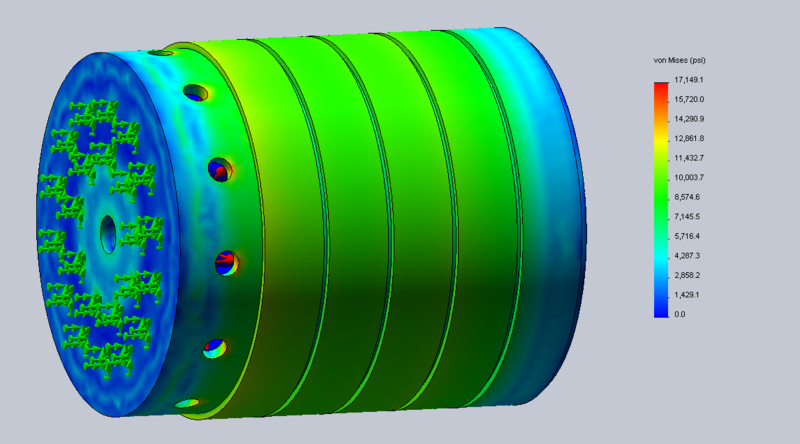 While the hot gas flows inward to the center for exit out the center top, the gaps between tubes gets smaller and increased in velocity across the tube. 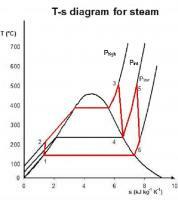 This takes advantage of the increased heat transfer with turbulent flow (higher Reynolds number). The gas would generally flow radially inward through the tube nest. 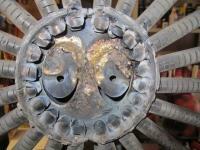 The intent is to use a foundry type burner that enters tangent to the circle to create the spiral flow. The temperature gradient shall be 700 deg F at the bottom and 400 deg F at the top. Mono-tube flow will be in a counter flow direction to the hot gas. This is in a downward clockwise spiral and return to the top through the center. This configuration will remind you of a White boiler. 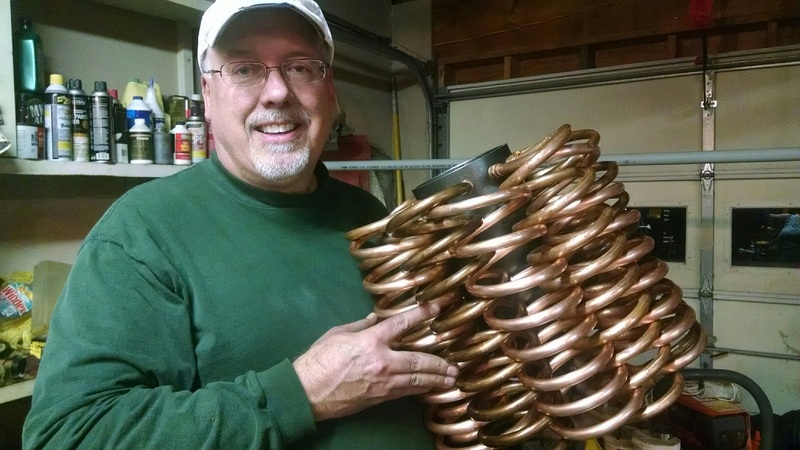 Instead of pancake coils, these are vertical coils with the same trapping of water philosophy. The smallest diameter tubing is in the center with increasing cross sectional area as the tubes are placed toward the outer diameters. The natural circulation tubes will be with the flow of hot gas. 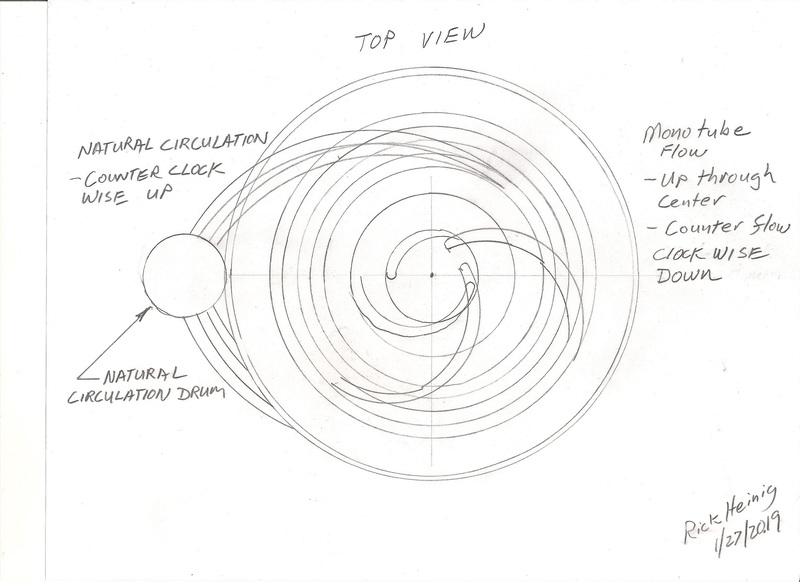 This is in an upward counter clockwise spiral to the drum. 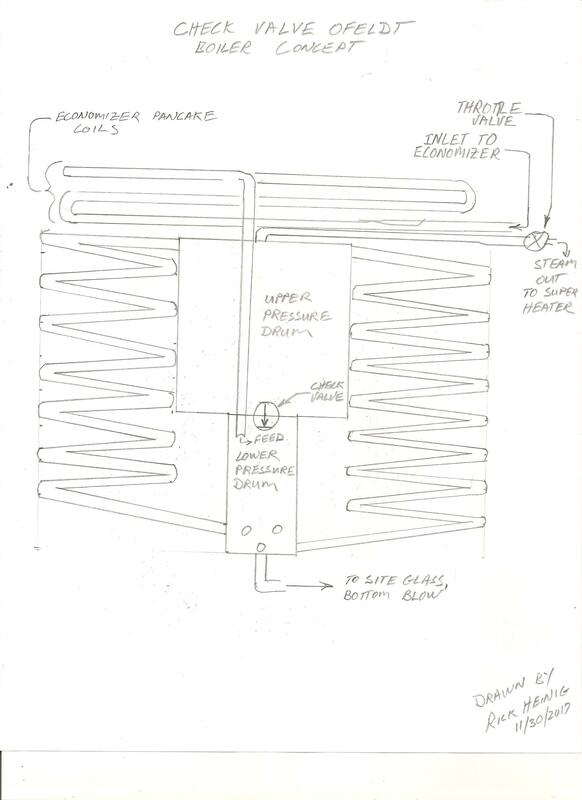 The water supply can go through a feed water heater and economizer (pancake coils above the coil pack). The steam exiting the drum, via throttle valve, can go through super heat coil below the coil pack. If I were to explain this boiler to Babcock & Wilcox, this would be a combination mono-tube and water tube. 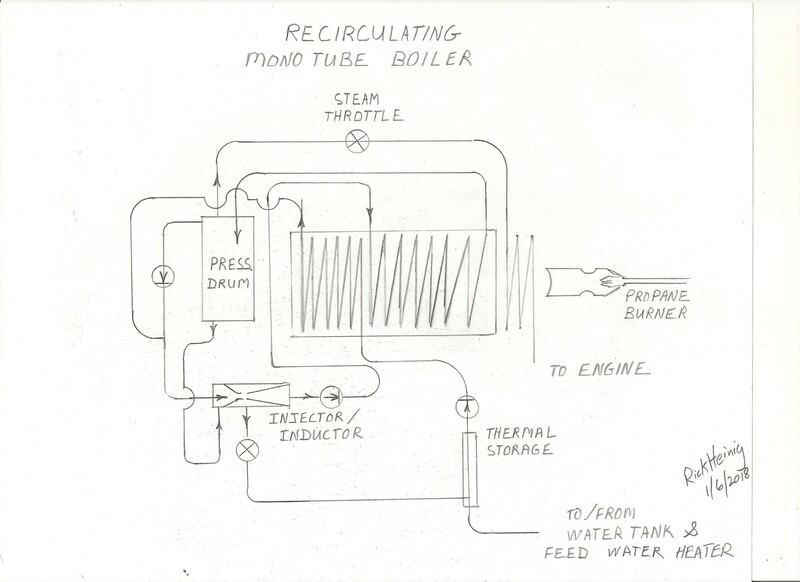 A quick aside, the forced circulation boiler is a mono-tube with circulation to/from a drum. The design favors steam generation through continuous increasing cross section, mono-tube. The natural circulation in the tube boiler part would be considered a slave generator to the mono-tube. The lion share of the steam generation is intended to be through the mono-tube. The design intent is to achieve a quick generating, light weight boiler with enough steam reserve to accomplish quick acceleration from a stall at zero engine rpm. I ran into the problem with the silver brazing on one of my heat exchanger coils the fins melted, there was an issue of a circulating pump was off and the exchanger coils it was copper tubing 3/8 with .049 wall thickness. By the time that realized what was happening is was far to late, glad I used thick wall copper tubing. Edited 1 time(s). Last edit at 01/29/2019 10:08AM by Jeremy Holmes. 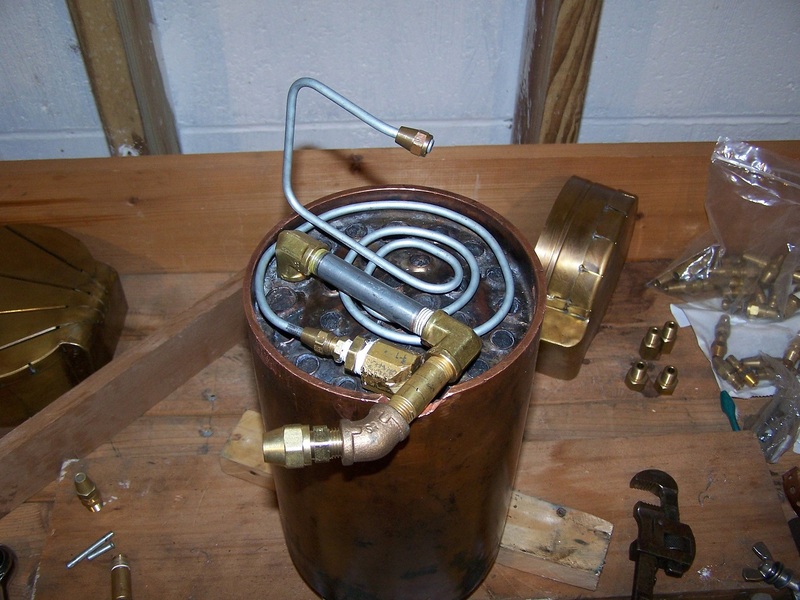 Brazing can be tricky especially if using unique configurations like finned tubing. I do recommend trying to use fittings where practical i.e. the joint from the Drum to the Tubing. Always get the best heat distribution on the braze to get that silver stuff to flow. 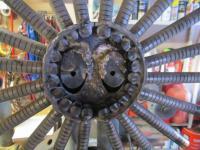 Weld the fitting to the drum with accessibility to the inside (if possible) and then braze the tube to the fitting. Then, think about welding the tube sheets to the drum as the last step. Ron has good examples of this method during his Ofeldt Build. Note that Ron's Ofeldt is good to 1,000 X 1,000 (PSI X Deg F respectfully) my opinion. Jeremy, you give me a good discussion point that I've been avoiding, sort of on purpose. The question or discussion is what material would I use on the mono-tube and water tubes? My apologies if you or ones reading this may think that I'm proposing the boiler be made out of copper tubing. I only showed you a picture of my Ofeldt which has copper (M) tubing and a schedule 40, black iron drum 3-1/2" that is seamless. I ordered it special from Canada (love those Canadian...eh). The Ofeldt is for a 85% Scale version of the Stanley H, using a 10 HP Stanley Dry Engine and limiting it to a 400 X 400 machine. It's important to have planned limits for the machine you're building. 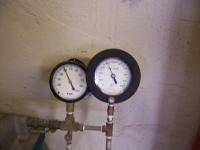 Pressure and Temperature are important to Engine stress and corrosion. 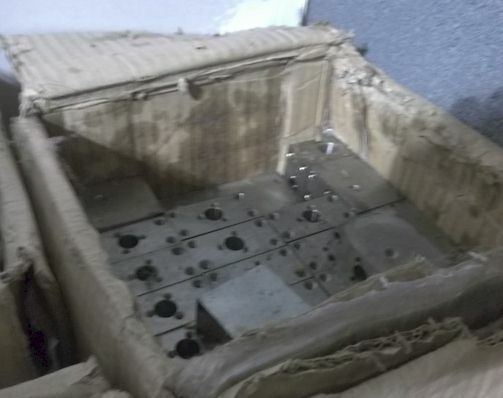 Sorry because I have to be careful to recommend material when it may be in conflict with Engineering standards or in practices recommended in associations that pertain to Mechanical Engineers, i.e ASME. So what I'm going to talk about is my opinion and not a recommendation...please do not hold me to any standard and consider this off the record. OK...the material to consider using for the tubes in this boiler being proposed are as follows: Black iron pipe, Stainless Steel (SS) and Carbon Steel Hydraulic Tubing. The answer is use what you can work with that can be coiled, silver brazed and is available where it does not cost you an arm-&-a- leg. I have seen these types of materials used successfully and without incident (at least major incident...just ask Jamison). Note that SS is in conflict with ASME. We are working with a classification of a M boiler and have some liberty or leeway. I would probably build this boiler out of SS with a Schedule 80 Black Iron Drum, seamless. Second to my Steam Engine hobby is making Beer It seams a lot of other people have jumped on the band wagon...good choice! So this provides synergy to purchasing SS tubing that is called out for making beer. Just type in "Beer & SS Tubing"...wonderful results. Finishing up this thread, going to provide a concept for IR in a burner configuration. Last is to broach the subject of going Super Critical (SC) with Steam. 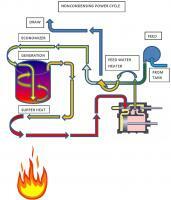 Leave you with a question, what tube material would you use for a SC Steam Boiler (over a thousand Degree F)? 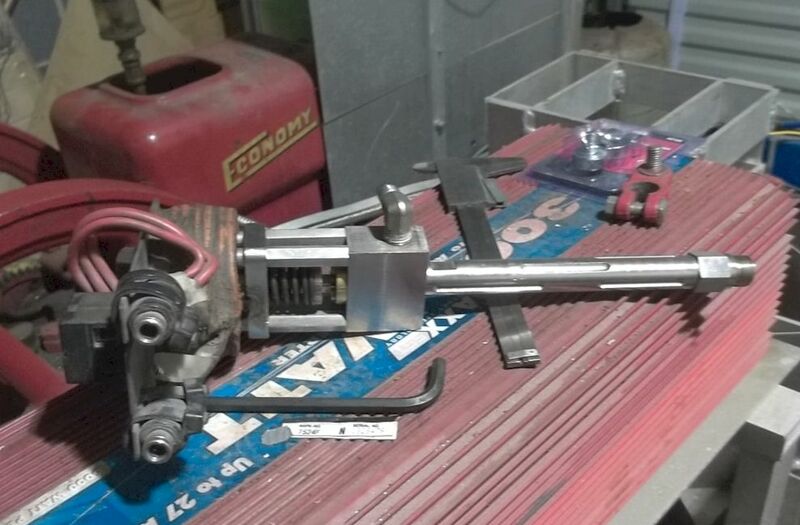 To conclude this post, let us talk about the Burner. Since the boiler is a hybrid concept, yup you guessed it, let's make the burner a hybrid. 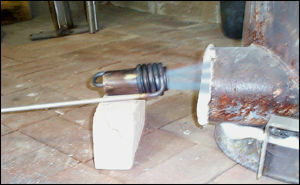 The concept is to combine IR with a high flow burner. I think you all understand the IR stuff. 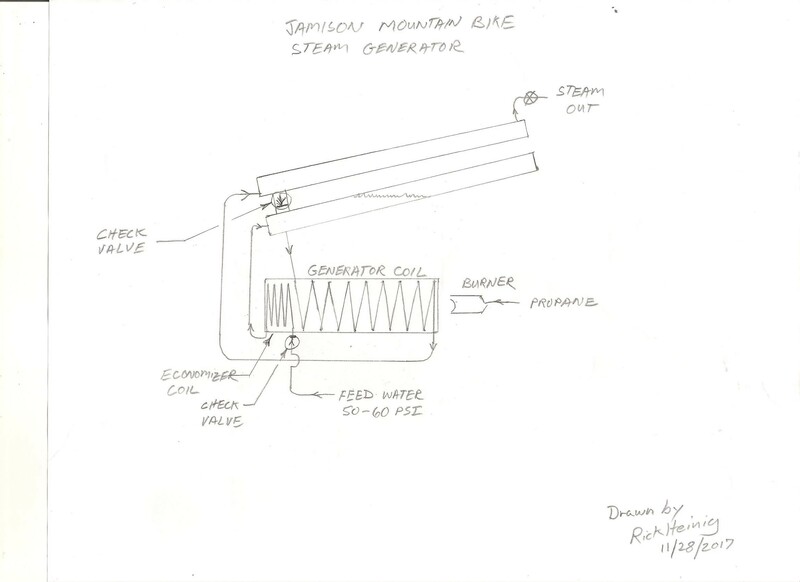 However, the high flow burner is conceived from Ron to Jamison to now my adaptation. The ratio between the two is 1 to 3, that is IR to High Flow (HF) respectfully and in the terms of energy, we can use the BTU terms. Also, lets put an assumption into it, 60K IR and 180K HF in BTU. There is a big difference between IR and HF burners. 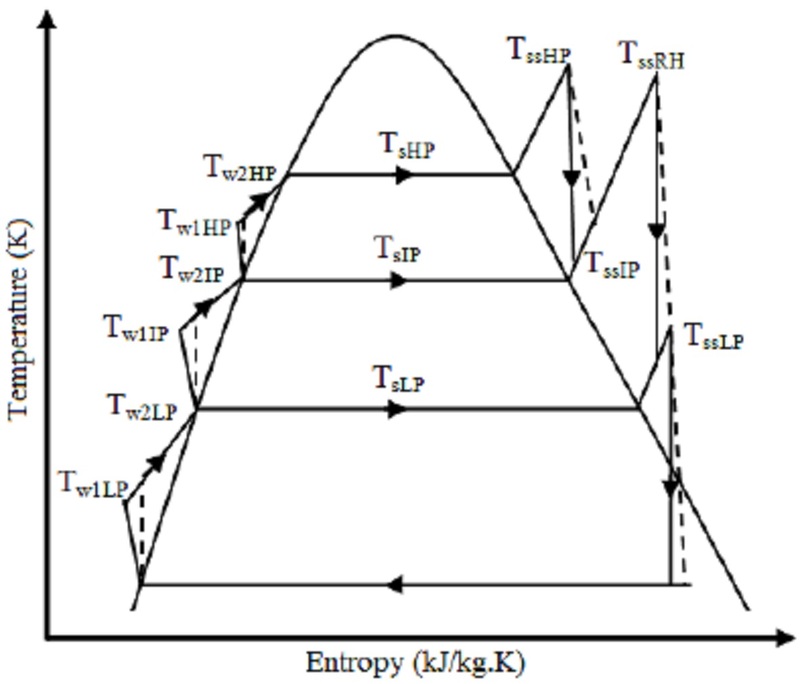 IR is based on not moving hot gas where HF is with moving lots of hot gas. 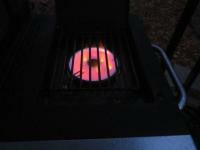 IR burners are good for grills. My grill has a side IR burner pictured. Like my Ofeldt burner, flow of the inlet air/fuel mixture needs to be damped so it distributes and burns evenly. Pictures show how I used plumbers putty to test my burner with baffles. The baffles will diffuse the flow and this is required in an IR burner. A pressure burner as I call it has high flow. Attached picture is of a foundry burner and is typically introduced tangential to the melting drum and in this case, to the boiler shell at the bottom. The configuration is to have the IR burner in the center, underneath the first mono-tube. Then have the spiral HF burner running counter clockwise up through the mono-tubes/water tubes. Also, the burner pan will be highly reflective. Then the side walls, highly reflective. Perhaps use high temp clear coat enamel sprayed on the metal surfaces after they have been polished. This to reflect the IR. Another interesting thing about IR, as surfaces become heated, they emit IR and so on throughout the boiler. OK...it's been fun! Thanks for listening. Now it's time to move on to some sort of Super Critical system. However, I don't think our piston steam engines are suitable for SC steam. The reason for me to pursue SC is to use it as fuel, yes fuel. Note that when one releases SC water, it turns to dry steam instantly. This has a very high Entropy. I'll let the cat out-of-the-bag, I'm working an electrode, a special plating to enhance the High Temperature Electrolysis (HTE). 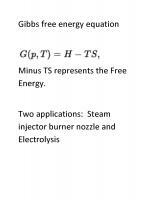 The last picture is the Gibbs equation. 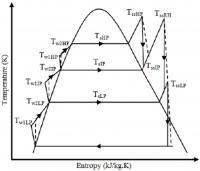 This shows the beauty of high Entropy, it actually subtracts from the formula to lower the energy to split water. On the particular system I have experience with is nothing short 3/8 thick wall copper tubing. 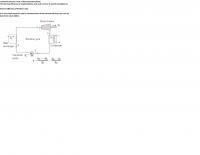 The circuit is not pressurized and circulated with a thermal heat transfer fluid. 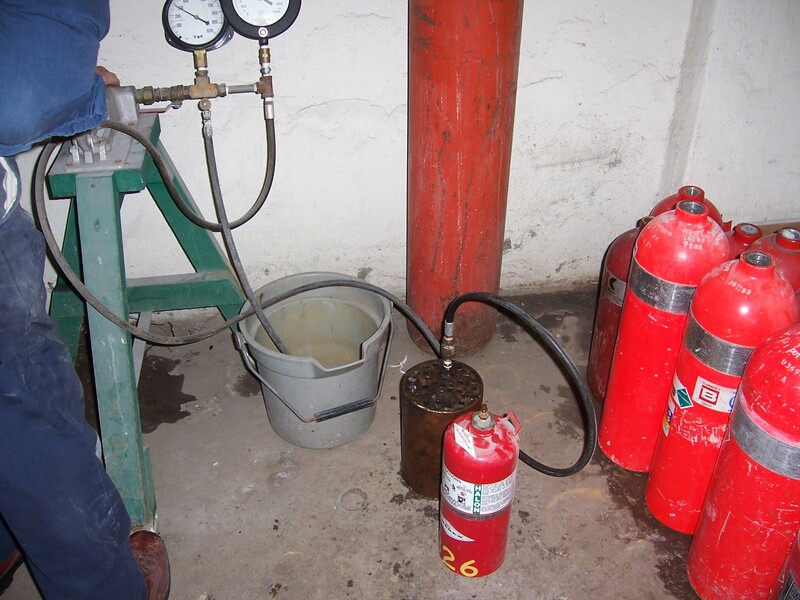 I do not use convection circulation can run a circulation pump use oil for thermal transfer. Needless to say if the thermal transfer fluid came in contact with the burner things would get bad real fast. The temperature of the circulated fluid operated around 400f more of a Lamont type of system thats not under pressure. Just to keep things in perspective there are two other heating systems, one is very high pressure for the injective flash steam, next the engine cylinder @400f, then a contact with superheated low pressure device. I admire your work. From an overview, I believe your system is taking advantage of going from water to dry steam, instantly. If I'm correct, this provides significance, greater efficiency. In reading about super critical power plants, this is the end game. I'm hoping Scott might add to that. An analogy to a Stanley Engine, it is equivalent to bringing super hot water to the valve on the engine. Let the valve release the water and instantly goes to dry steam, in the clearance volume and cylinder. SACA member Bill Ryan thinks along these lines also...remember his Go-cart video and hot head engine? Please, respectfully correct me if I'm wrong? It is a valuable concept to explore...to me at least! Perhaps we should start another thread? I used to give Jim Crank(he never cared) a hard time on the forum. Its very fortunate for me to have interacted with him on this forum for years. I learned a lot, and some of his knowledge was absorbed by me. What Im trying to say that over several years his knowledge base was absorbed by me and he did influence the evolution of my design. I hate to be redundant but to the best explanation of the fully designed engine.. Generally the boiler is part of the completed engine. Edited 2 time(s). Last edit at 01/30/2019 12:35PM by Jeremy Holmes. Beat my record of "most words per post"? I don't think so! I can beat your attempt. And here I go. I... uh... wait, what were we talking about? Were we talking about something? But seriously folks, Hiram Maxim beat all the [later] steam car guys in lbs/hr/steam/sqft & lbs/hr/weight/boiler-cost steam generation. With shorter/more-numerous recirculation flowpaths than he used, it could easily be done without the jet-booster circulation he used, just natural circulation and very small drums to take up the "boiler swell". 3/8" OD x 0.020 wall copper tubes; 6 foot long flowpaths max. Do the math, if you can. All hot-gas-exposed tubing filled with fast-natural-circulating water; tube temps like 20F above sat steam temp . Fast-circulating copper tubing would last for decades at 500psg/470F in daily automotive service, no rapid pinhole corrosion as in mild-steel high-radiant/hi-emissivity "Lamont" style boilers. There's the secret for a kickass steam car boiler. Dismiss it as "old-fashioned", "primitive", etc at will. Oh, no economizer needed either, for about 80% net thermal boiler efficiency, which is about the practical limit. 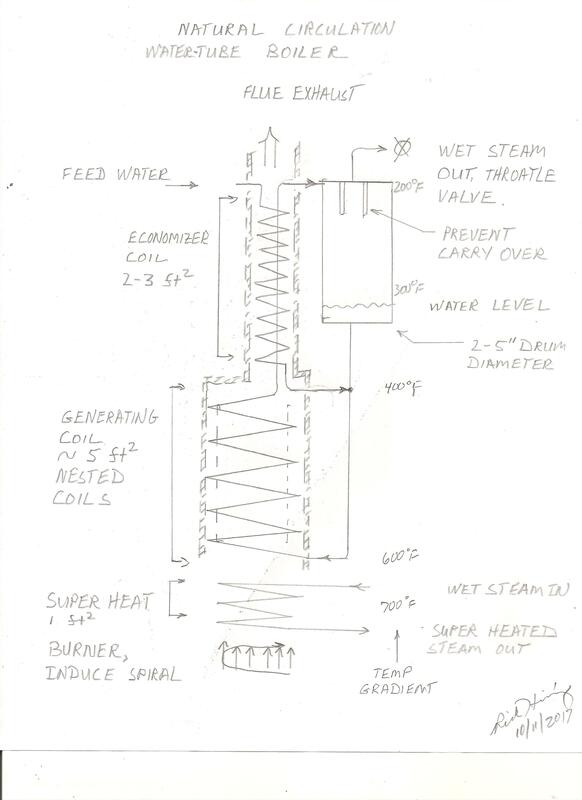 However I do currenty plan to use an exhaust-steam feedwater heater, about 8 feet of 1" OD steel pipe in exhaust-steam path. 15" circulation head for previous boiler setup, plus 60 flowpaths. All gibberish until you do the math. Look up the Bryan boiler to get an idea; my design is closely based on that.